Instant Messaging services remain a popular way to keep in touch over the internet. While some predicted that instant messaging would die out and be replaced by social networks like Facebook, the fact that Facebook has now fully integrated an instant messaging service into its network proves that people still want to communicate by simple, quick text messages. Of course, there’s still the same problem of several different, incompatible services. To partially solve this problem, the multi-protocol instant messaging program was invented. Rather than having two or more separate IM programs all cluttering up your PC, you simply run one program that can connect to multiple services. There are now lots of different programs for Windows that offer to connect you to all your friends across the different chat networks. In this review we will be looking at Digsby, IM+, Jitsi, Pidgin and Trillian. Digsby, Pidgin and Trillian you may remember from our last round up in 2011, while IM+ and Jitsi are two new contenders that bring their own unique features to the mix. Digsby – Digsby focuses on giving the user fast and easy access to both IM and social networking services and also integrates e-mail into one handy program. IM+ – A powerful multi-protocol instant messaging service on mobile platforms, IM+ joins our round-up this year with it’s new Windows 8 tile version. Can a Windows 8 app perform as well as its desktop competitors? Jitsi – Another newcomer this year, Jitsi is an exciting, open source multi-protocol instant messaging program with a strong focus on privacy and video chat. Pidgin – The faithful old bird returns for another year. Pidgin is a much loved, lightweight open source IM client that is supported by an enthusiastic base of developers and users. Trillian – A feature rich instant messaging package that claims to prioritize interoperability and security. We’re happy to report that installation was a breeze on all of the clients. All the desktop clients resisted the temptation to offer us toolbars and other junk software that has become all too common on Windows desktop software installations recently. IM+, being a Windows 8 tile app, installs through the Windows store automatically. Choosing which interface you prefer among our contenders is largely down to taste. Both Digsby and Trillian 5 have a modern looking interface and offer various skins. Pidgin and Jitsi have more basic looking interfaces, although their interfaces are uncluttered and easy to navigate. IM+ is a Windows 8 tile app and is therefore optimized for touch, with larger text and icons ideal for poking with your fingers. 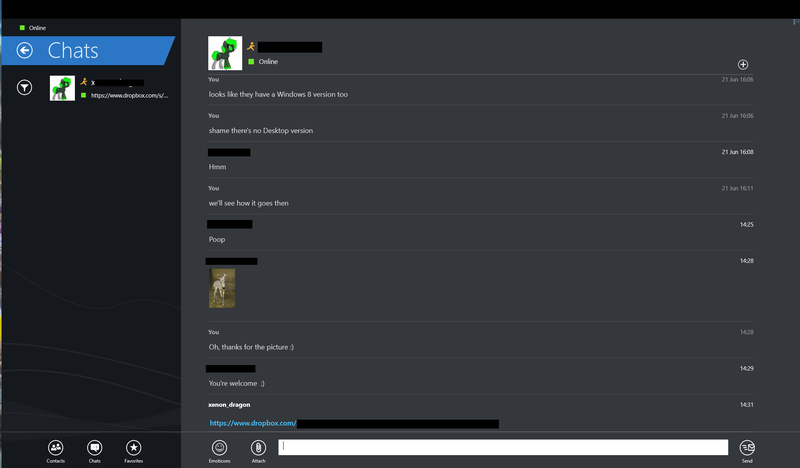 While IM+ won’t suit desktop users, its interface is a huge improvement over the (now discontinued) messenger app that came with Windows 8. The acid test for an IM client is of course how well it handles basic chat. To test, we set up various conversations between a PC and a iPhone device running either the iOS version of Trillian or IM+. Chatting was comfortable on all the applications, all of the desktop programs support tabs, allowing you to easily keep track of multiple conversations. IM+ places the currently active chat in the middle of the screen, with other chats easily accessible on the left. In testing, there was only one program that had issues with basic chat. Unfortunately, when chatting using the Yahoo protocol, Jitsi failed to deliver our messages. While our contact was notified that we were typing a message, the messages never arrived after sending. Jitsi also had issues connecting to Facebook chat, giving us an invalid certificate warning on each connection. These two problems are a real shame as Jitsi really shines in other areas, as we’ll see later. Digsby, Trillian and IM+ are all free but ad-supported, meaning you will see adverts on the interface as you use them. Trillian offers a subscription service for $20 a year, which will disable all adverts in the program, or for $60 you can eliminate adverts forever. This charge also includes use of Trillian’s cloud history feature. With this setting enabled your chat history is saved in the cloud and can be accessed wherever you use Trillian, either on desktop or on a mobile platform. While convenient, we can’t help feeling that most users would rather their entire IM history was not sitting on a server on the internet for an indefinite amount of time. IM+ also offers a premium service, for £3.49 you can disable adverts in the application forever. Pidgin and Jitsi are free and feature no adverts at all, a definite plus for these open source contenders. Notifications are those pop-up messages that let you know when a new IM comes in. Digsby and Trillian use their own custom notifications that allow you to quickly reply to incoming IM’s and see new tweets and Facebook posts. You can even reply directly into the notification if you don’t want to open your IM program. Jitsi also uses its own custom notifications. Pidgin can use notification plugins and take advantage of the excellent Growl notification system, which allows pop-up notifications from all your programs to have a consistent look and feel and can even be customized to send notifications over your home network. IM+ uses the standard Windows 8 notification system. All of the IM clients tested supported the popular Google Talk, MSN, Yahoo, ICQ and AOL protocols. Pidgin has an enthusiastic developer community and supports a huge range of other protocols too, from the occasionally useful to the downright bizarre. Of course, the quality of the plugins varies. Likewise with Jitsi and Trillian, plugins were available to extend the functionality of the program, though there were far fewer than on Pidgin. Trillian and IM+ were the only programs with support for Skype, though for video chatting you will still need the official Skype client. Digsby comes in last place as it lacks support for popular protocols like IRC and has no plugin interface for third party developers. For secure IM conversations, we recommend the Off The Record (OTR) plugin. This is the only instant messaging encryption protocol that’s been properly tried and tested. In this test, Jitsi was a clear winner, having full OTR support built in. Not only this, but Jitsi also includes encrypted password storage and password management. Pidgin has no secure password storage facilities but does support OTR via a plugin. Installing the plugin is easy and OTR support works fantastically and flawlessly. IM+ does not currently have OTR support on the Windows build, though the feature is promised as a premium feature for a future update. Currently the iOS version of IM+ does support OTR, though the implementation is not without its issues. For instance, leave a conversation on your iPhone and the OTR session is immediately terminated, making this feature too inconvenient for any regular use. Let’s hope the Windows version works out better, especially as this is a paid add-on to the program. Both Digsby and Trillian have very smooth support for Twitter, Facebook and a host of other social networks. Twitter and Facebook can both easily be read from within the programs. New wall posts can be made and new tweets can be sent. Trillian’s tabbed interface for social networks beats Digsby’s, though both programs integrate social networking really well. Pidgin offers only very basic support for social networks. Facebook chat is available and a plugin allows tweets to be sent, but the functionality is very basic compared to the slick integration of Digsby and Trillian. IM+ and Jitsi also offer basic support for Facebook chat, but generally no support for Twitter. Jitsi also had issues connecting to Facebook chat in our tests. While chatting to your friends on IM, it’s very convenient to be able to send files to them, so it’s a shame that so many of our contenders performed badly with this operation. In first place in this test came Trillian. Talking to a friend on the Yahoo protocol, we were able to send and receive files just by dragging and dropping them onto the chat window. Trillian uploads any transferred files to Cerulean software’s own servers, thus overcoming compatibility problems with peer to peer file transfer. Pictures were sent with a thumbnail preview directly in the chat window and files could be sent just by dragging and dropping them. It’s important to note that in our test, both parties were using Trillian and when this is not the case there can certainly be more difficulties. In second place in this test was IM+. Again, IM+ uses its own servers to send and receive files, resulting in much better compatibility. We didn’t always get a thumbnail image of the picture our contact was sending us, but sending and receiving worked reliably. Unfortunately, neither Digsby, Pidgin or Jitsi seemed able to send a file to our contact. Attempting to send a file would result in an error message saying that the receiving party had cancelled the file transfer. These clients were able to receive files from users running IM+ or Trillian but not from other users running Digsby, Pidgin or Jitsi. If you use webcams or voice with your online friends then most of our contenders will leave you disappointed. Digsby has limited support for webcams that works by simply sending both users to a website which contains basic webcam software. More of a workaround than a proper solution. Trillian comes closer to providing proper support. Over the Yahoo protocol, we were able to establish a webcam connection between ourselves and another contact running Yahoo Messenger. However, there was no support for voice, making this feature somewhat useless. Pidgin has very limited support for voice and video chat via some experimental plugins, and IM+ does not currently support voice and video chat. The shining star in this test was Jitsi. It’s easy to see that this program was built as an open-source alternative to programs like Skype. Using either Jitsi’s own XMPP service or Google Chat, video and voice chat with the program was easy to use and very stable. On slower internet connections video was often lost or corrupted, but that’s as to be expected. Audio quality was excellent even with slower broadband connections. Best of all, Jitsi can fully encrypt voice and video conversations, making this an excellent alternative to Skype for the privacy conscious internet user. Lots of us are using several computers and devices now and Digsby and Trillian go some way towards bridging the gap between different computers and in Trillian’s case, the mobile phone too. Digsby will synchronize settings between computers, including Linux and Mac computers. Trillian will not only synchronize settings but chat history too, allowing you to start a conversation on one PC then continue it seamlessly on your phone or on another desktop. It’s clear that Cerulean consider this to be their killer feature. While this feature works well and is convenient, considering how often websites and services are hacked, we can’t help wonder how wise it is to leave your entire IM conversation logs hanging around on a server in the cloud. IM+ can synchronize your settings across Windows 8 machines, Jitsi and Pidgin do not offer any kind of synchronization at this time. Windows 8 only, IM+ is optimized for touch screens. All our contenders have their strengths and weaknesses and unfortunately the situation is still that no one program can claim to cover everyone’s instant messaging needs. Which one you choose will depend on your own personal needs and your budget. Pidgin is still one of our favourite multi-protocol IM programs. Despite initially seeming the most basic of the three clients, we can’t help admiring Pidgin. It’s lightweight, ad-free, highly customisable and supports a huge range of plugins and extensions, covering more protocols than any of the other contenders. With strong OTR support, Pidgin has your main privacy concerns covered too, as long as you keep your PC secure so that your passwords don’t fall into the wrong hands. Jitsi is probably the most exciting newcommer. The clear winner when it comes to privacy and voice and video chat, it’s a real shame that the program failed so badly with Yahoo chat and had issues with Facebook chat connections. We can only hope that these bugs are worked out and Jitsi becomes the IM client of choice. Trillian 5 is another program it’s hard not to admire. Its interface is uncluttered, its social networking support is excellent and it supports more protocols than Digsby. Trillian even has support for chatting while you play a full-screen game, and this feature worked in several popular games we tested it with. The cloud chat storage and device synchronization is a wonderful idea, privacy concerns aside and it is clear that Cerulean consider this to be a major selling point. Sadly, lack of adequate privacy safeguards and broken OTR support let the program down. For a premium product, Cerulean Studios need to do better. The only package that came close to offering complete webcam and voice support was Jitsi. Even with Jitsi, webcam and voice support is limited to Google Chat, SIP and XMPP connections. That means that for many of us at least, the days of installing two or more messaging programs are still likely to be with us for some time to come. If we have to pick a winner, then based on the overall performance as a general IM program, we’d have to choose Pidgin as our top rated Windows IM program. Though clearly depending on your needs and priorities you may prefer Trillian or Digsby. If you use your Windows 8 machine as a tablet, IM+ is certainly worth checking out and Jitsi is highly recommended for video chat especially if all the talk of Skype being snooped on has put you off that particular service.